The brilliant mind of Pete Dye is on view every year as the Players Championship unfolds at TPC Sawgrass. A one-time swamp that the former insurance salesman transformed into a golf course in 1980, the place has seen plenty of controversy in its time, and certain holes (17?) will forever divide opinion. After numerous alterations, however, the course is now almost universally admired. Dye, 92, began his design career in the early 1960s influenced mostly by Robert Trent Jones. Following a trip to Scotland in 1963, however, and after designing a course (Radrick Farms) for the University of Michigan in 1965 and seeing Alister Mackenzie’s design of U-M’s first course, his style and philosophy changed somewhat. Pot bunkers, wooden bulkheads in bunker faces, small greens, and a greater emphasis on strategy as he sought to get in the minds of good players while keeping it playable for average golfers, became characteristics of his courses. It was a combination that once created much heated debate. But considering the number of successful architects he mentored (including Bill Coore, Tim Liddy, Lee Schmidt, Bobby Weed, Jim Urbina, Jack Nicklaus, Rod Whitman, John Harbottle, his two sons Perry and PB, and Tom Doak to name a few), how many of his courses have genuinely earned the “Championship” tag and have been ranked in various top 100 lists, and his induction into the World Golf Hall of Fame in 2008, its fair to say Pete Dye (while not forgetting the influence of his wife Alice, of course) will be revered as long as golf is played. 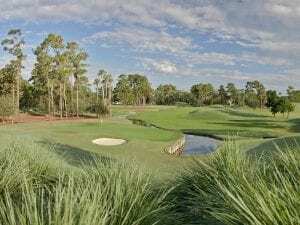 TPC Sawgrass – Ponte Vedra Beach, Fla. There are multiple packages that include play on the Stadium Course at TPC Sawgrass, and if you don’t use one of those multi-round/lodging bundles you could pay as much as $550 for 18 holes. That’s big money but, like the green fee at Pebble Beach, people determined to experience one of the game’s most iconic courses are happy to pay it. You’ll have stories (and probably video evidence) of your attempt to ace the 17th forever. 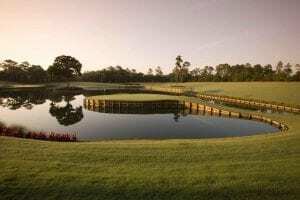 Visit TPC Sawgrass’s website here. 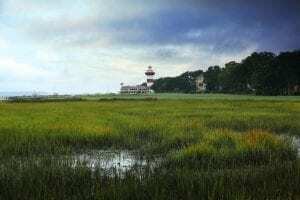 Harbour Town Golf Links – Hilton Head Island, S.C. Designed with significant input from Jack Nicklaus and opened in 1969, Harbour Town has hosted a PGA Tour event every year since. Part of The Sea Pines Resort on Hilton Head Island, it commands a green fee of $350+ and is a terrifically important course as it demonstrates how a 7,000-yard (or thereabouts) layout can still provide a challenge to the world’s best without resorting to acres of deep rough and absurdly quick greens. Visit The Sea Pines Resort’s website here. Ocean Course – Kiawah Island, S.C.
After Hurricane Hugo devastated Dye’s work on the Ocean Course in 1989, he had to work fast to have it ready for the 1991 Ryder Cup. The hurricane actually enabled Dye to incorporate a few features he hadn’t been able to before and, at Alice’s insistence, the holes furthest from the ocean were raised so a view of the sea could be had from everywhere on the course. Comments during the ‘91 Ryder Cup ranged from “dramatic” to “extravagant” to “ridiculous,” but Dye was no doubt satisfied his course had provoked a lot of discussion. Those not staying at the splendid Sanctuary Hotel or other Kiawah Island resort lodging pay upwards of $400 for 18 holes in season. Visit Kiawah Island’s website here. PGA West Stadium – La Quinta, Calif.
TPC Sawgrass and Kiawah Island certainly polarized opinion in their early days, but the reaction to them was relatively mild compared to what some (many? most? everyone?) said about the Stadium Course at PGA West when it opened in 1986. Dye, urged on by then PGA Tour commissioner Deane Beman, created numerous excessive hazards and a course that really did look unlike anything else. There were a dozen or more potential disaster holes, and competitors in the 1987 Bob Hope Classic (now CareerBuilder Challenge) were less than impressed, successfully petitioning to have it removed from the schedule. There are times you stand on a tee, look down the hole and think “Really? Again?” But it’s another must-attempt challenge every Dye fan has to take on. 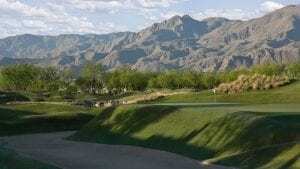 Visit PGA West’s website here. Whistling Straits – Kohler, Wis.
A number of courses that describe themselves as “links-like” or “links-style” really are clutching at straws, but the term communicates perfectly the type of golf found on the Straits Course. 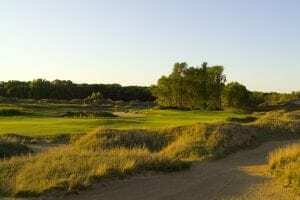 It’s set by the water (Lake Michigan), has innumerable pot bunkers sprinkled liberally throughout, can be buffeted by the wind, and looks very much like a links course with its dramatic dunes. But those dunes were built by dozers, and the greens are a highly-maintained bentgrass. It’s close, but not quite the genuine article. Never mind, it’s still a rollicking good ride. Another $400 green fee in season but, you guessed it, lots of people play it. Visit Whistling Straits’s website here. 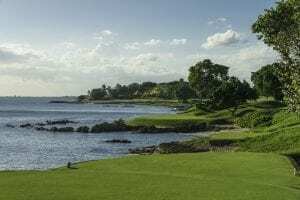 There are other great publicly-accessible Dye courses closer to home, but if you want to see what many believe is his best ever design—one that never provoked a frenzied backlash, you need to jump on a plane and head for La Romana. Dye made superb use of the oceanfront here with seven unforgettable holes on the Caribbean Sea. But the inland holes are full of great golf too. Visit Casa de Campo’s website here. 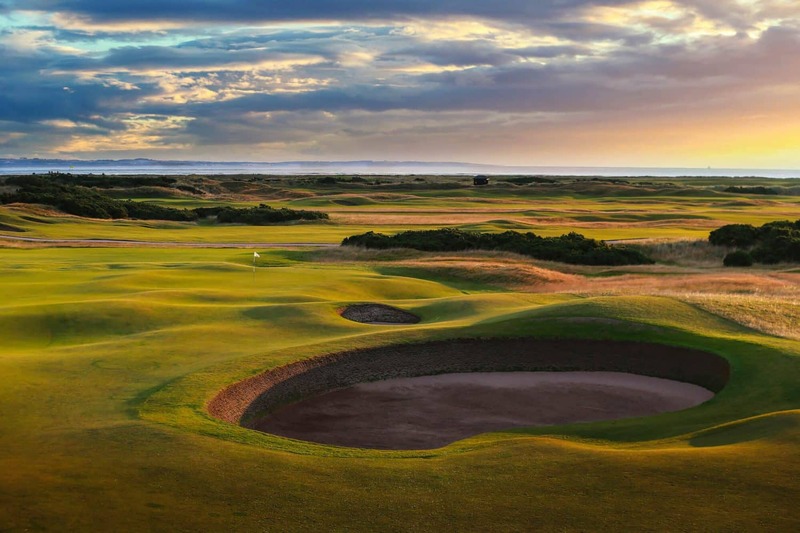 Honorable Mentions – lesser-known public Dye courses with less-burdensome green fees. – Blackwolf Run (River, Meadow Valleys) – Kohler, Wis.
– French Lick – French Lick, Ind. – Paiute – Las Vegas. Nev.
– Rum Pointe – Berlin, Md. – Riverdale Dunes – Denver, Colo.
– The Fort – Indianapolis, Ind. – Pound Ridge – Pound Ridge, N.Y.
What’s your favorite Pete Dye course that you’ve played? Let us know in the comments below!